Every room has a view to the sea. Very comfy. The bad... Some people do not realize that having so much wood and textile means a big fire risk and throwing the smoked cigars outside from the balcony is not the right way. Already informed the Village management team about this. The hotel owner was wonderful! He's super helpful and always greeted us with a big smile. Our room is spacious and clean and the ocean view is stunning. The breakfast was delicious and satisfying. Where to find Sozopol hotels near an airport? Where can I find hotels in Sozopol that are near tourist attractions? If you want to visit Bourgas - South Black Sea Coast and want to book a quality hotel or apartment in Sozopol, there is a wide range of great accommodation options with Expedia. Expedia's extensive database has 16 accommodation options within 0.1 kilometres (0.06 miles) of Sozopol's heart. Finding convenient accommodation close to the bright lights of inner-city Sozopol is only a few mouse clicks away. Expedia's up-to-the-minute database lists the Diamanti and Hotel More, which are located a short distance of Sozopol's city center. The Selena Beach Hotel is a budget hotel. 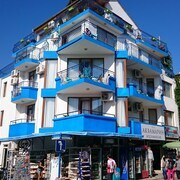 It is nicely situated 2 kilometres (1 mile) from the center of Sozopol. Travelers could also have a look at the Hotel More. 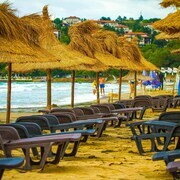 You could investigate the Sol Nessebar Mare and also the Iberostar Sunny Beach Resort - All Inclusive. The Sol Nessebar Mare is located 25 kilometres (16 miles) from the middle of Sozopol. The Iberostar Sunny Beach Resort - All Inclusive, is 30 kilometres (19 miles) away. Another option is to check out the amenities and rates at the Hotel Juli or the Sol Nessebar Palace - All Inclusive. Looking for more to do? Why not spend some time visiting Sea Gardens and Burgas Beach, which you'll find in Bourgas, 20 kilometres (13 miles) to the northwest of Sozopol. 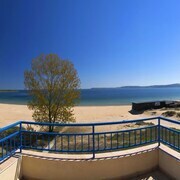 Bourgas hotels and accommodations include the Primoretz Grand Hotel & SPA and Hotel Bulgaria Burgas. 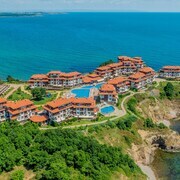 30 kilometres (20 miles) to the southeast of Sozopol, you can also stay at Tsarevo, which is home to the Oasis Resort & Spa and Primea Boutique Hotel. Should you choose to stay in Tsarevo, a couple of places to add to your itinerary are the Georgi Kondolov Cultural Center and Church of Sveti Tsar Boris-Mikhail. Consider spending an afternoon rubbing shoulders and cheering along with Bourgas - South Black Sea Coast sports fans at a local game. You'll find Ticha Stadium 90 kilometres (57 miles) to the north of Sozopol. 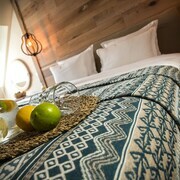 Book a hotel close to the action at the Dallas Residence or the Graffit Gallery Hotel. Burgas Airport is 20 kilometres (13 miles) from Sozopol. Should you choose to stay nearby, you can easily secure a room at the The Clara Aparthotel & Residence or Atlantis Resort & SPA. 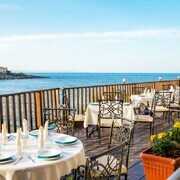 What are the most popular Sozopol hotels? Are there hotels in other cities near Sozopol? 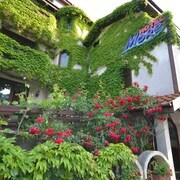 What other types of accommodations are available in Sozopol? Explore Sozopol with Expedia.ca’s Travel Guides to find the best flights, cars, holiday packages and more!